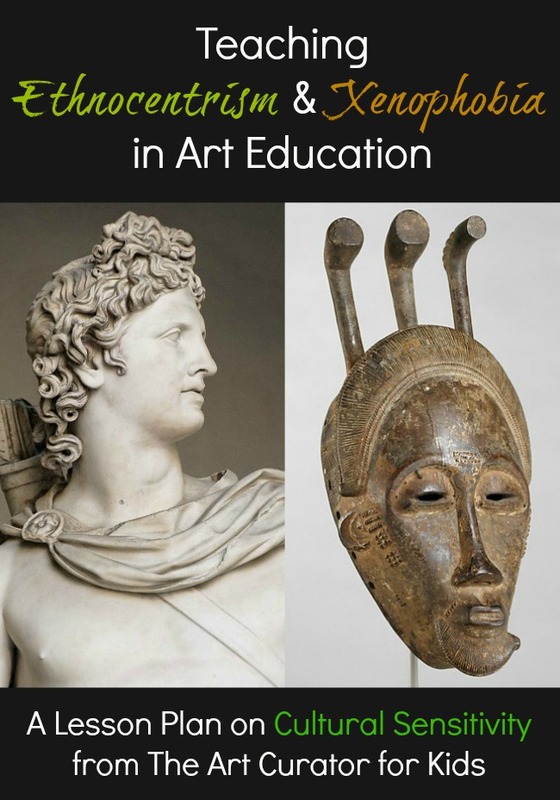 Inside: Five tips for how to lead a classroom art discussion that will get your students thinking about and enjoying works of art. Looking at art is an inspirational and emotional experience. 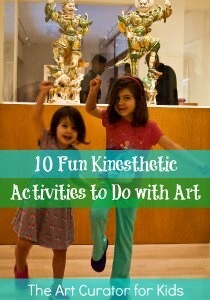 Talking about art is a launching pad for creativity, collaboration, and cognition. A meaningful classroom art discussion helps students develop empathy, flex thinking and observation skills, connect with history, and savor the human spirit. But the idea of leading such a discussion fills many art teachers with dread. What if my students don’t say anything? What if they ask a question I don’t know the answer to? Fear not! 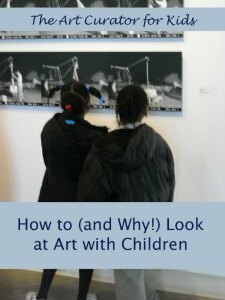 Students want to look at artwork and they have a lot to say about it. 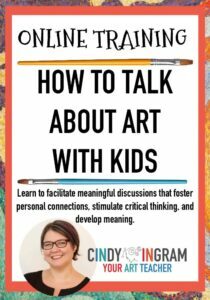 Your classroom can become a place where vital, interesting discussions about art happen regularly with these five tips. The goal here is not to pick an artwork that all of your students will love. That’s an impossible task! The goal is to choose an artwork that will spark questions and is open to interpretation. I love showing The Two Fridas to students. There’s so much going on that their minds race at first sight. Why are they holding hands? What’s going on with the hearts? No two discussions about The Two Fridas will be alike and that makes it a perfect artwork to share with your students. When choosing art to discuss, look for pieces that catch your eye and make you wonder what’s going on. If you’re curious, your students will be too. Some students will be bursting with thoughts. Others need space to let their ideas build. Give them all time to gather their thoughts by having a silent observation period at the beginning of class. 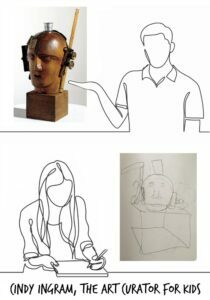 Students can write down what they notice, answer a question you pose, or sketch the artwork. These bellringers allow them to focus and brainstorm before they’re influenced by their classmates. 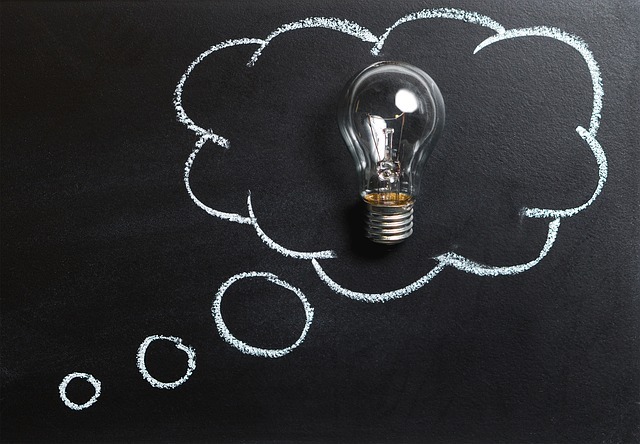 A vital part of getting students to engage is giving them the freedom and support to have their own ideas without fear of being wrong or ridiculed. Create a classroom culture that celebrates differences of opinion and doesn’t hold any one interpretation up over another (even the opinion of you, the artist, the museum, or an art historian). To encourage open conversation, consider not sharing the title or other information about the artwork. If you do, wait until the discussion has taken off and with the reminder that there are no “right” answers. You want to give your students the freedom to be open, but you can’t stay silent and facilitate a meaningful classroom art discussion. So, what do you do? 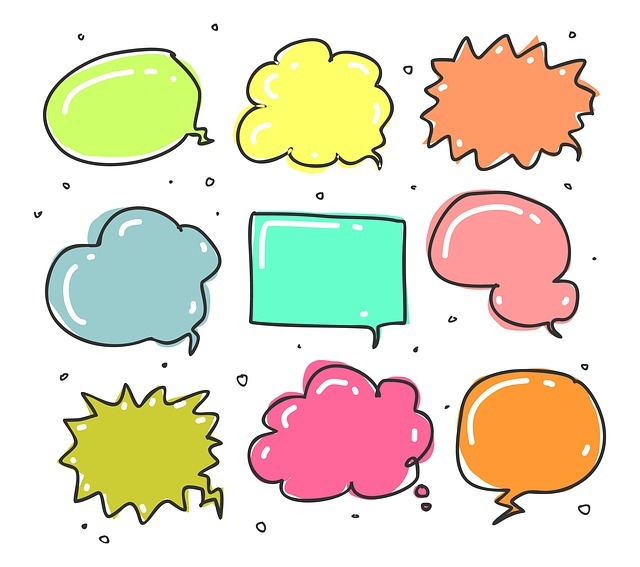 When a student tells you one of their observations, repeat it back to them and ask questions to make sure you understand what they’re saying. Don’t be afraid to dive deep and ask multiple questions. When students are heard and understood, they’re more likely to speak up again. If you get a question about interpretation instead of an observation, direct it back to the student. 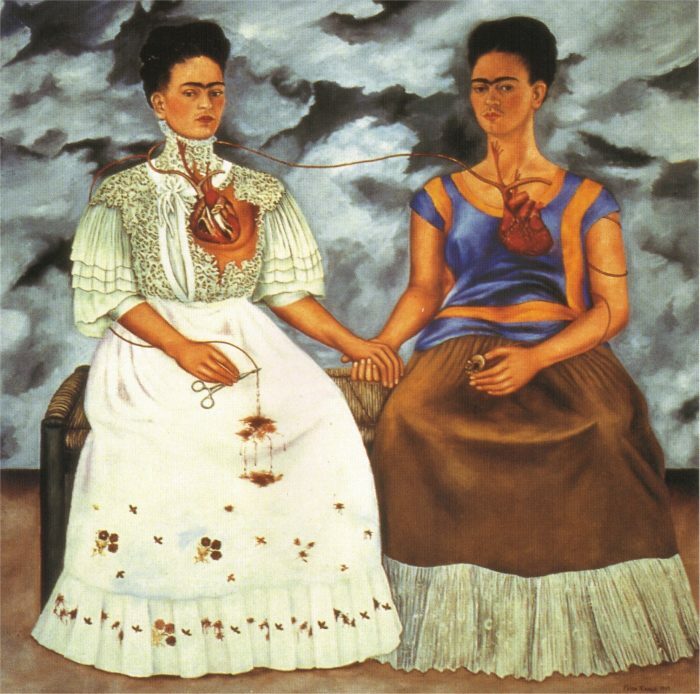 For example, if they ask why the two Fridas are holding hands, ask them what they think. You don’t have to praise every comment to encourage your students. No one likes to receive forced or false praise. The simple act of listening and repeating to show you’ve understood is more than enough. When I’m teaching, I constantly move around the room. When a student is speaking, I stand near them so they know that I’m listening. I want every student, including the introverts and the ones at the back of the room, to know that they are a part of the discussion and expected to share their thoughts. 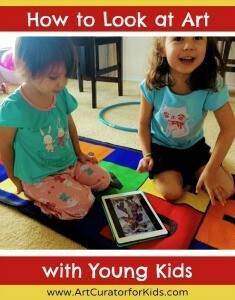 This strategy works great for behavior and to keep everyone on track. If they know you could walk by them at any moment, they are more likely to stay involved. Silence doesn’t mean the discussion is over. Allow those moments for students to ruminate and observe more. These stretches are a great opportunity for more reserved students to gather the courage to speak up. If you start to feel uncomfortable, take a breath. Choose a student who hasn’t said much, then make and maintain eye contact. Embrace the awkward. Even if it takes a minute, someone will get the ball rolling again. If you have a particular class that struggles with open discussion, carry a clipboard and take note of when someone makes a comment or goes off-task. You don’t have to announce it. Just make eye contact and write an ‘x’ or a check. They’ll notice and begin participating on their own. Another option is to call on students directly through something like drawing names out of a bucket. These are handy tools but rarely necessary. If you have stage fright, rest easy. This isn’t a lecture. You don’t have to do all the work or know all the facts. If you don’t know an answer, ponder with the students and share the joy of discovery and creativity. Enjoying art and the desire to share that joy is why you became an art teacher. This is the dream! A teacher’s enthusiasm is especially beneficial to a classroom art discussion. Your passion will spread to your class. Celebrate the process of discovering an artwork together and delight in your students as they show their creative, thoughtful, humorous selves. 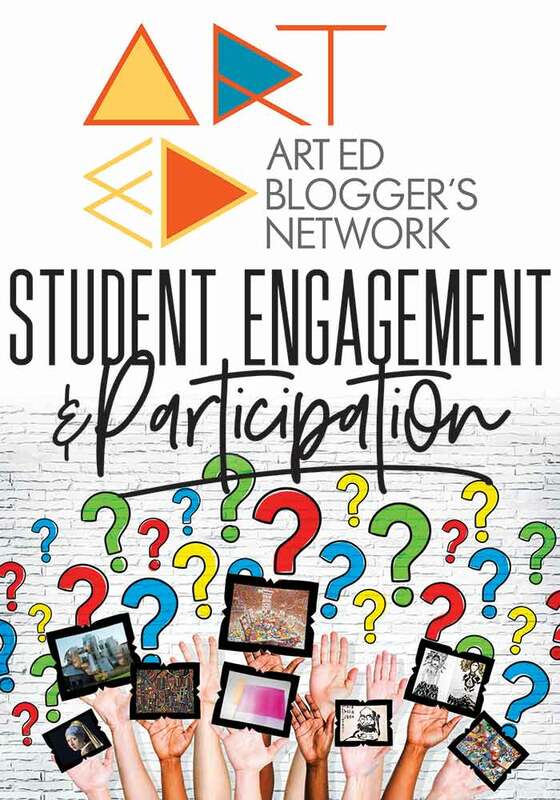 This post is a part of The Art Ed Blogger’s Network: Monthly Tips and Inspiration from Art Teacher Blogs. On the first Tuesday each month, each of these art teacher blogs will post their best ideas on the same topic.